Ten minutes later, bare grass, thanks to an enthusiastic horde of smallish children. 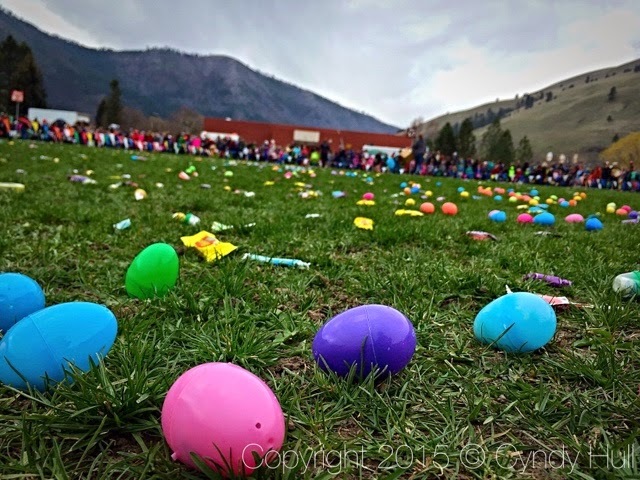 Thanks to a generous horde of volunteers and sponsors, the 22nd Annual East Missoula Community Egg Hunt has grown into a gathering, with so much more to enjoy - for free! - than just an egg hunt - bouncy houses, little kid games, food, and exploration opportunities on fire trucks and police and rescue vehicles, including the Life Flight helicopter. A good time was had by all.